Ken Riesch, Owner of R&R Insurance Services, was honored with the 2013 Distinguished Citizen Award by the Potawatomi Area Council Boy Scouts. 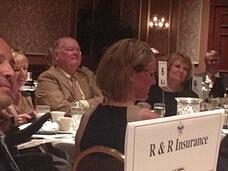 The award banquet was held on Thursday, September 12, 2013 at the Country Springs Hotel in Delafield, WI. Troop 5 Boy Scouts of the First Presbyterian Church in Waukesha were on hand for the color guard and Pledge of Allegiance, with Joanne Blaesing of Marine Bank as MC. Friends, family and R&R employees were present to acknowledge Ken's tremendous commitment to the community and the honor code of The Boy Scouts, and to celebrate this great achievement. Kevin Steiner of West Bend Mutual Insurance, and Jack Riesch of R&R Insurance Services gave heartfelt tributes to Ken, calling out his leadership and commitment to family as key components of Ken's admirable character. 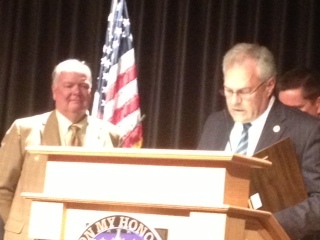 Dan Vrakas, Waukesha County Executive, presented Ken with the Distinguished Citizen Award, citing additional acknowledgment of Ken's achievements by Wisconsin's Governor Scott Walker. Congratulations to Ken Riesch for this wonderful achievement. We are all so proud to have you as our leader, and are humbled by your commitment and generosity to the community and the families of R&R Insurance Services.